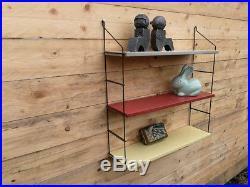 Vintage Mid Century Retro Industrial wall shelf. 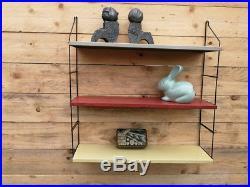 Artdesigncollectibles Presenting this week a very nice Vintage Mid Century Retro Industrial wall shelf Tomado Eames Era This Wall shelf will make a great addition to any Fifties Sixties Seventies Modernist Mid Century Modern Design interior. 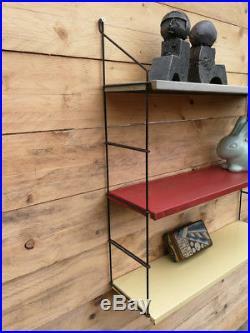 It is a fantastic piece of Mid Century design. Items are not included in the action. Please see the detailed pictures!!!! Lenght 65 cm/25,54" and Height :65 cm /25,54" Depth 17 cm/ 6,69. 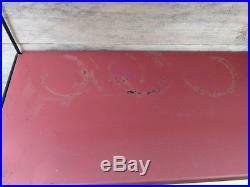 Very nice Used vintage condition, Sporadic age-related normal signs of use The red layer with more signs of use but no dents Please do not hesitate to contact me if you need more photos or info I will do my best to mention all or any imperfections. If you have questions I answer them with pleasure!! All our items are 2nd hand or used goods so there are signs of using(vintage condition). Please do not hesitate to contact me if you need more photos or info If you have questions I answer them with pleasure! USA, Russia - 26 USD Noord-ZuidAmerika - Canada - Mexico 26 USD Azie - Australie - Japan 26 USD Italy Austria Portugal Denmark Turkey Spain Norway 21 usd France, Germany, Luxembourg and United Kingdom 15 usd Belgium and Netherlands 6,75 euro. 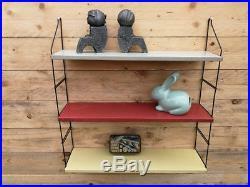 ALL PICTURES SHOW THE OFFERED ITEM. This stunning item is an absolutely BEAUTIFUL piece. A GREAT ADDITION TO ANY COLLECTION! I THINK THE PICTURES SAY MORE THAN WORDS CAN EXPRESS. 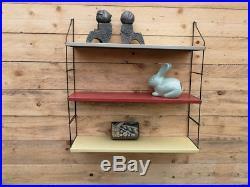 The item "Vintage Mid Century Retro Industrial wall shelf Tomado Eames Mategot Era" is in sale since Monday, June 4, 2018. This item is in the category "Collectibles\Vintage, Retro, Mid-Century\1960s". 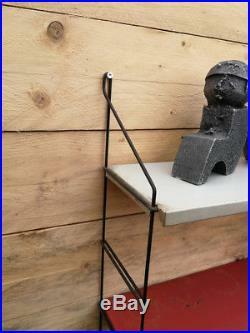 The seller is "artdesigncollectibles" and is located in Leopoldsburg. This item can be shipped worldwide.